Ganga was born in Port Fairy, Australia. His musical journey began as a child when he started playing kit drums at age 8. Inspired by a dream, he followed his calling and began to play didjeridu the very next day. It has been a natural progression for Ganga to create a new contemporary sound by mixing funky rhythms through the didj especially since the sound he was after wasn't available on the market. Influenced by many varied genres, including East Indian Tabla and African percussion, he has married indigenous Australian and world music with fat funky dance beats, and has found an appreciative audience across the globe. Ganga Giri has gained the respect of Aboriginal didgeridu (yidaki) players for his unique approach to didgeridu playing. Deeply inspired by the sacredness of Australia's land and how that feeling can be expressed through the didjeridu, he has become an ambassador for his country, offering his world-wide audience a reflection of contemporary multicultural Australia. The music took my muddy boots and threw them about for a bit, next thing I knew the dub from the decks had infected my spine and my whole body was bouncing. This carried on throughout the set, until its climax. At which point the sun and blue skies appeared and grinning like a child I went off to get an ice cream! Scott Williams Glastonbury Festival review. 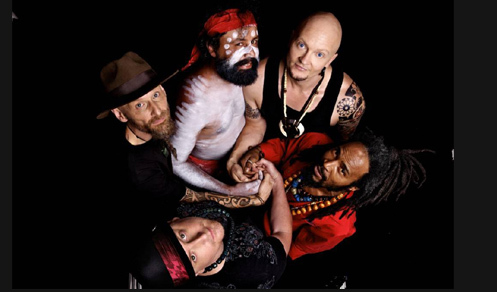 Ganga Giri, a psychedelic tribe of musicians that create an amazing multi-layered blend of indigenous/electro/dance/rock, and upon my first vision of Giri dancing around the stage, waving his arms around and playing his didgeridoo at the same time, he'd won me over. Ganga Giri is a wonderful musician. I first heard him at a Womad festival, and loved the mix of his ancient and primitive instrument with a wide range of great dance grooves. Ganga is really taking the didjeridu to places it has never been before and developing a unique style of music."